I made it to the Final Four. Yep. Me, a guy just shy of six feet tall with “limited” quickness, agility, speed, and verticality who can’t go to the left hand; I made it to the Final Four. I never saw the floor and I had to buy a ticket…but I made it to the Final Four. 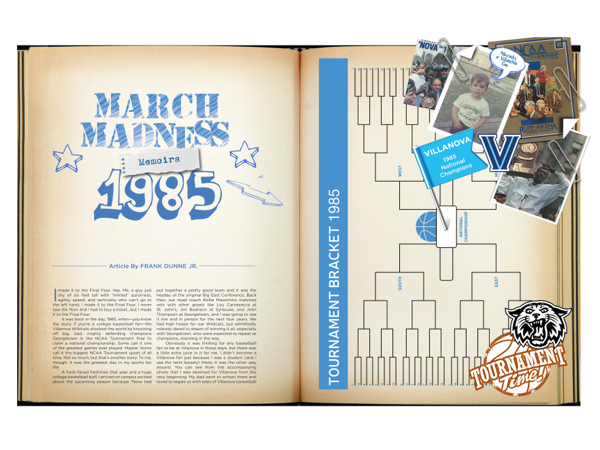 It was back in the day, 1985, when—you know the story if you’re a college basketball fan—the Villanova Wildcats shocked the world by knocking off big, bad, mighty defending champions Georgetown in the NCAA Tournament final to claim a national championship. Some call it one of the greatest games ever played. Maybe. Some call it the biggest NCAA Tournament upset of all time. Not so much, but that’s another story. To me, though, it was the greatest day in my sports fan life. A fresh-faced freshman that year and a huge college basketball buff, I arrived on campus excited about the upcoming season because ’Nova had put together a pretty good team and it was the heyday of the original Big East Conference. Back then, our head coach Rollie Massimino matched wits with other greats like Lou Carnesecca at St. John’s, Jim Boeheim at Syracuse, and John Thompson at Georgetown, and I was going to see it live and in person for the next four years. We had high hopes for our Wildcats, but admittedly nobody dared to dream of winning it all, especially with Georgetown, who were expected to repeat as champions, standing in the way. Obviously it was thrilling for any basketball fan to be at Villanova in those days, but there was a little extra juice in it for me. I didn’t become a Villanova fan just because I was a student (and I use the term loosely) there; it was the other way around. You can see from the accompanying photo that I was destined for Villanova from the very beginning. My dad went to school there and loved to regale us with tales of Villanova basketball greatness in the 1960s. In my teenage years, we would watch the Wildcats in the NCAA Tournament with guys like E-Z Ed Pinckney, Dwayne “D-Train” McClain, and Gary McLain. They played some exciting games, almost always the underdog, but could never break through to the Final Four. Nevertheless, those guys were heroes to me, and now I was walking through the same quads and sitting in the same classrooms with them. The ’84-’85 basketball season turned out to be a bit of a rocky road for Villanova and ended on a very sour note with an 82-65 drubbing at the hands of Pittsburgh before tournament play began. We were worried that a regular season record of 18-9 wouldn’t be good enough for an invitation to the NCAA Tournament and that the only hope would be to win the Big East Tournament. That didn’t happen. The ’Cats did avenge Pittsburgh with a win in the first round, but were soundly beaten by St. John’s in the second round. Now all we could do was wait and hope that the NCAA Tournament Selection Committee would deem ’Nova’s 19 wins significant enough to offset their 10 losses. They got in as an eighth seed, which basically means not much was expected of them in the tournament. I had a greater concern. Bragging rights. You see, I grew up outside of Detroit and had many friends from high school at Michigan. We didn’t have texting and Twitter back then (Heck, we didn’t even have cell phones. If you wanted to call home, you used the pay phone at the end of the hall.) so we couldn’t talk smack in real time like we do today. My fear was that, if we lost to Michigan, my friends would bottle it all up and then assault me with a fusillade of trash talk that summer. If we lost to Michigan, I could never go home again. I think we watched that game in Hogan and Bartelone’s room again. This time we paid more attention, and Villanova won 59-55. This time we celebrated too, by making a lot of noise and drinking beer. Now it was getting interesting. Next up, Maryland. Again we were worried. Maryland already beat us by three earlier in the season, and they had Len Bias, one of the best players in the nation. How good was he? I’d say he was the closest thing we had to LeBron James in that era. Bias was eventually drafted by the Boston Celtics, but sadly died of a cocaine overdose before ever playing an NBA game. Anyway, we watched that game in Newman and Grosso’s room because they had the biggest TV on the floor. This time Villanova won by three, and we were starting to sense that something magical was afoot. To celebrate, we made a lot of noise and drank beer. So Villanova had already accomplished the impossible: They had advanced to the Elite Eight and were one win away from the coveted Final Four. All that stood in the way were the North Carolina Tar Heels, coached by the recently departed Dean Smith. Everybody in the basketball world said the clock would strike midnight on Villanova’s Cinderella tournament run. It didn’t. Villanova won convincingly, 56-44. We watched that game in Newman and Grosso’s room because they had the biggest TV on the floor. To celebrate, we made a lot of noise and drank beer…and Newman got in trouble because of it. It turned out that a local TV news crew was wandering around campus to do a little slice of life piece. They wanted to see what those crazy Villanova kids would do if our team reached the Final Four. Somebody told them to go to Newman and Grosso’s room in Fedigan Hall because our game watch parties had become legendary. So we and our beer bottles got on TV! Unfortunately the dean of students watched the news that night and was not pleased. We weren’t “officially” allowed to have beer in a freshman dorm because…well…we were all freshmen and nobody was of legal age. But we partied in the dorm anyway until we heard from somewhere in the distance, “We gotta get out to the quad! Everybody’s there!” So we dropped everything and raced to “The Quad.” Sure enough, everybody was there, all 6,000 of us hootin’ and hollerin’ and throwing rolls of toilet paper. One hit me in the face, but I didn’t care. My boys were going to the FINAL FOUR! Word spread that there would be a pep rally to greet the team when they returned to campus at about 3 a.m. So all 6,000 of us headed to the old fieldhouse, one of those old-fashioned brick fieldhouses that only seated about 3,000 for a basketball game. Somehow we all packed in (probably in violation of fire codes) and awaited our heroes’ triumphant return. It was quite a spectacle, like a rock concert. When the team took the stage, the roar was deafening, and the mass of humanity crushed forward…like a rock concert. Thankfully, I don’t believe there were any injuries. Not much studying got done that week. It was all about the mad scramble to get tickets to the Final Four in Lexington, Kentucky. There weren’t many to go around, and you had to sign up for a lottery to get them. So you signed up and cut deals with as many “proxies” (people who had no interest in buying tickets but would sell you theirs if they hit the lottery and you didn’t) as you could find. That, or you worked your connections with alumni, faculty, and staff if you had them. By whatever method, Newman, Lumpy, Whitey, Critter, my big Sis (she was a sophomore), some other guy and I got lucky and scored tickets. We rented a car, got a Trip-Tik from AAA (no GPS in those days) and drove through the night to Lexington. I don’t think Sis enjoyed riding 10 hours in the car with me, Newman, Lumpy, Whitey, Critter and that other guy much, but I know she had a great time at the games, and it was pretty special to be able to share the whole experience with my big (although much shorter than me) sis. Georgetown beat St. John’s in the other semi-final to set the stage. Once again, nobody was giving Villanova much of a chance. No eighth seeded team with 10 losses is going to win this championship was the conventional wisdom. This was mighty Georgetown after all, the defending national champions with stars like Patrick Ewing (maybe the greatest college center of all time) Reggie Williams, Michael Jackson, Ralph Dalton, and Sleepy Floyd. It was a forgone conclusion that Georgetown would repeat as champions. Well, guess what? It was April 1, 1985. April Fool’s Day. Despite all the trials and tribulations of the season, our ’Cats had played nearly flawlessly since the Dayton game in Round 1 to get here. As great as Georgetown was, we knew our guys could play with them. They’d beaten us twice during the regular season, but only by a combined nine points, and one of the games went into overtime. We felt that probability was in our favor. Rollie Massimino was a brilliant tactical coach and was not about to lose to the same team three times. We also felt…well…we just felt something. So did the team. Like the semi-final game, the final game is a largely a blur in my mind. Most of what I remember about it I get from having watched on video a million times since. I do remember this, though: With a two-point lead and mere seconds to go, all Villanova had to do was inbound the ball and run the clock out. Dwayne McClain cut to his left to shed a defender as Harold Pressley threw him the inbound pass, but McClain tripped and fell! He caught the ball sprawled out on the floor and cradled it like a baby. Game over. Final Score: Villanova 66 – Georgetown 64. Villanova had done it.